Sous Chef will work through your cookbook, and then whenever you look at your inventory, loot or bank, will mark Provisioning Ingredients with the Provisioning item type. 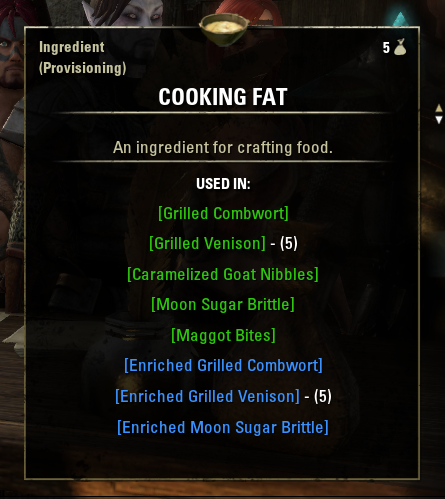 If you mouse over the ingredient, Sous Chef will let you know which recipes use that ingredient, along with how many of that recipe you can make with your current inventory. 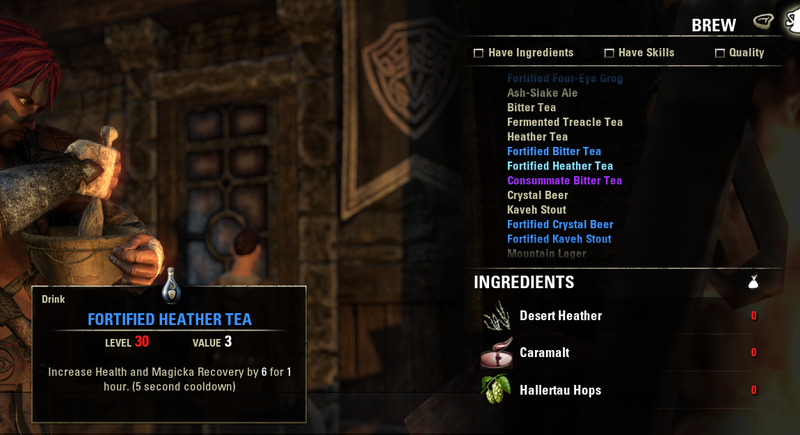 (Note, currently we're unable to match ingredients in the Guild Store). You can switch her behaviour to only show the details on left click, if you're short on Tooltip space. She will sort/group your known ingredients if you wish her to. She will also take note when you browse recipes, of any that you don't know, in your inventory, bank, guild bank and guild store, and mark them for your later elucidation. Let it not be said that your Sous Chef doesn't look out for you! 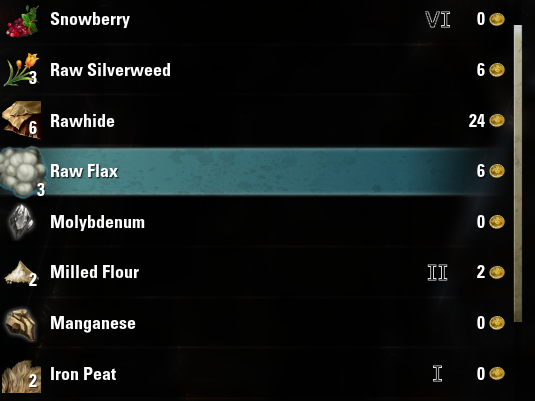 If you set Alternate Character Check on and have the Mark if recipes are unknown, then the tickmarks marking unknown recipes will be faded if an alternate character knows that recipe. Clicking once on the recipe will detail who knows that one. 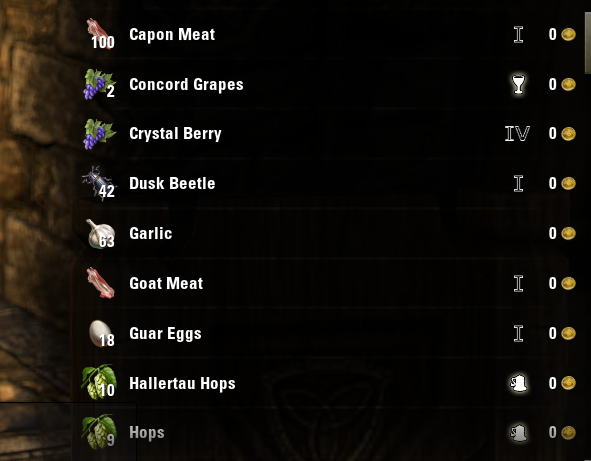 In the Provisioning table, Blue and Purple recipes will be shown in the appropriate colour! Thanks to Ayantir for the French translations, and sirinsidiator for the German translations! Please log a bug at the portal with some screenshots of your inventory where the bug is apparent, (You can use Imgur to host your images), screenshots of the error message if there's one, and place your SV file in PasteBin and link to it in the report. Hopefully, the recipe/result name mismatch problem will be solved with version 2.9. If you continue to have problems, even after disabling the experimental recipe matcher, please let me know in the comments. If a recipe name is in that list, it will not be considered for marking. Also note, that atm, links with accented/umlaut'd characters will not parse well, you will have to type out the name. I'll work on fixing that. v2.19a - removed all traces of the old checkbox. v2.19 - updated for the revamped provisioning system in Update 6.
v2.8a - now with updated manifest! Added in Spices and Flavour markings. Made the tooltip details concat to a single line. Added in experimental non-English Client recipe matching. 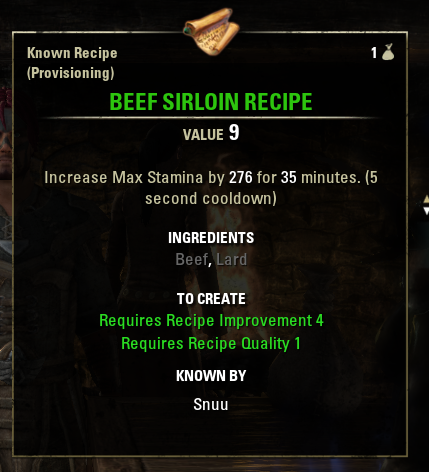 If you find a recipe and result that don't match, please log a bug with the details of both, so I can add the differences to the dictionary. Fixed Tier 3 on the bold icons. The file was of an incorrect sizing, and thus not showing. 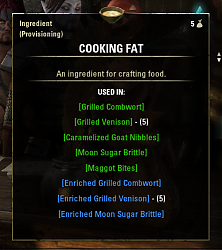 Capitalised the recipes. Requires a SV purge, so your settings will be reset. rolledback tooltip. Can't find a viable way yet. 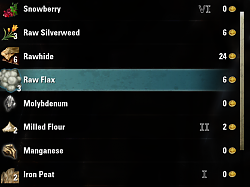 Fixed the Tier 3 ingredients not showing. Texture was one pixel too small in dimension. Is there a way to disable the "used in" list? 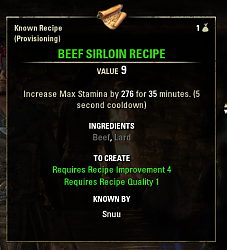 I'm looking for a way to disable the list on each ingredient that shows on which recipes it can be used on. I couldn't find an option to disable it, is there one? Or is there an easy way to change the display on the code? this amazing addon has been resisting all updates but now it's no longer working on bank guilds. anyone found a way to fix it? Last edited by SirAndy : 09/06/16 at 06:33 PM. Anyone else still getting this error? This addon is outdated since a year, just move to ESOMRL and request missing features here ? This one already have 90% of the features of SousChef. I uploaded a fixed version of Sous Chef under the "Other Files" sections. Updated to API version 100016, it works with the latest DLCs. When i hovered mouse ofer a stolen Muthsera's Remorse Recipe in a backpack container. I'm no programmer, and never attempted to make an addon. And most surely, the awesome person who made this addon will probably want to check it for the new update. Common.lua (it will be in the SousChef folder in the AddOns folder where you downloaded it). Quit and restart ESO, if you still have it running. I have no idea if it will break something else, or if will require other fixes, but at least that error message will not popup when you hover recipes. This works, thank you ! This is the Error I receive when I open my Inventory with Sous Chef Enabled. I really like this addon, its unique in its function. please don't let it die. Something don't look right in SousChef.... If you have the time, can you look into this? Love this addon! 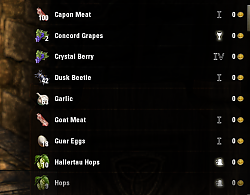 It's the only provisioning mod I've found (that I know how to work) that marks ingredients in loot. 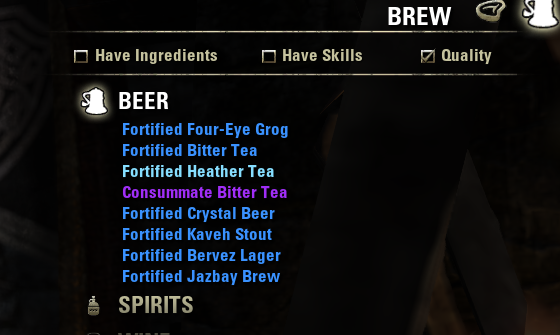 My wife and I play on the same account and she does all the provisioning; it's awesome to be able to set her character as the main so I'll know what to pick up while out looting. Thanks to all who have worked on it! Thanks for your work on this Baertram !